In 1968, visionaries from the city councils of Lakeside Park and Crestview Hills approached each other to discuss the possibility of establishing a joint police department. While both cities were small, they were growing and perceived the need for a professional police department. Pooling resources, they established the first Police Authority in the Commonwealth. The Chief of Police answers to the Authority Board which is comprised of five members of the respective councils. The councils alternate years of majority. The department was originally comprised of one full time officer who would be subject to call when off duty. The staffing level quickly rose to five. In 2001, the department expanded to its current staffing level of twelve sworn officers and one police clerk. The department’s area of responsibility includes a great deal of diversity. The core communities of both Lakeside Park and Crestview Hills are suburban neighborhood. Lakeside Park is a largely residential community with a great diversity of places of worship. It is also home to the Dixie Branch of the U. S. Post Office. Barleycorn’s Tavern is on Dixie Highway at Turkeyfoot Road. It is the site of the old toll house. Crestview Hills is home to Thomas More College and Research Park. The Crestview Hills Town Center sits prominently on Dixie Highway just south of I-275. You can visit their website at www.crestviewhillstowncenter.com. Many of the major traffic thoroughfares in Kenton County traverse our area. I-275, Turkeyfoot Road and Dixie Highway cause the department a good deal of traffic problems but they also bring many visitors to our cities and many customers to our businesses. The Police Authority Board is very supportive of the department. 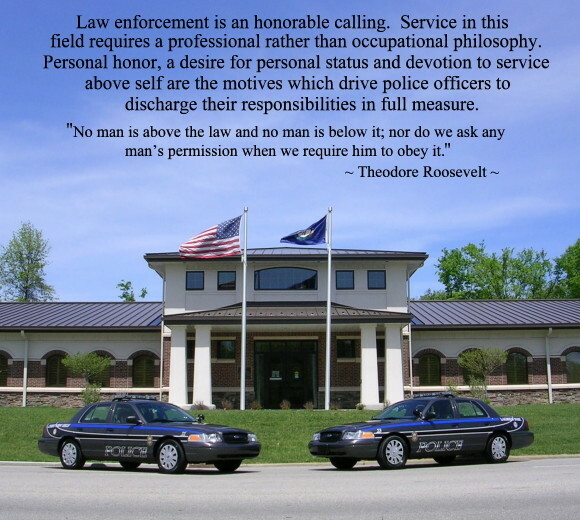 In 2002, with Board support, the department was granted a five-year certificate of accreditation by the KY Association of Chiefs of Police. We are proud to announce that in July of 2012, the department once again completed its Re-Accreditation process, certifying us for another five years.